Figure A. Purified mouse anti bovine CD1w3 (MCA1647G) detected with goat anti mouse IgG2b RPE (STAR134PE) and FITC conjugated mouse IgG1 isotype control (MCA928F). Figure B. Purified mouse anti bovine CD1w3 (MCA1647G) detected with goat anti mouse IgG2b RPE (STAR134PE) and FITC conjugated mouse anti bovine CD40 (MCA2431F). All experiments performed on red cell lysed bovine blood gated on mononuclear cells. Figure A. FITC conjugated mouse anti bovine CD40 (MCA2431F) and purified mouse IgG2b isotype control (MCA691) detected with RPE conjugated goat anti mouse IgG2b (STAR134PE). 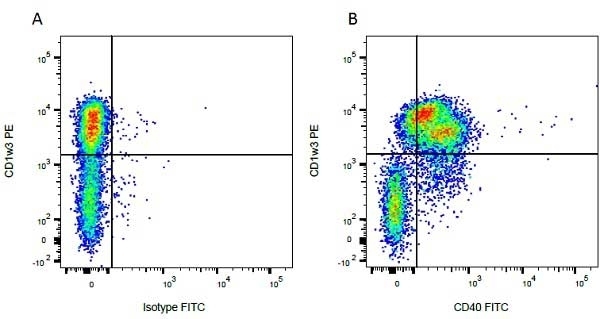 Figure B. FITC conjugated mouse anti bovine CD40 (MCA2431F) and purified CD1w3 (MCA1647G) detected with RPE conjugated goat anti mouse IgG2b (MCASTAR134PE). All experiments performed on red cell lysed bovine blood gated on mononuclear cells. 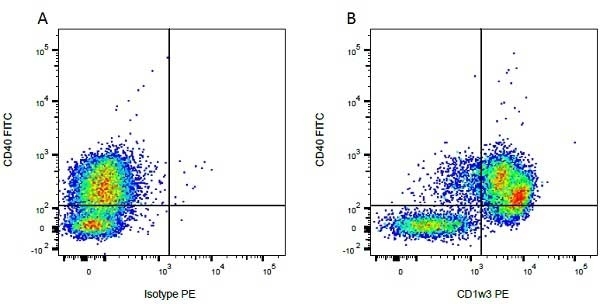 Mouse anti Bovine CD1w3 antibody, clone CC43 recognizes the bovine CD1w3 cell surface antigen, a ~44 kDa molecule expressed as a heterodimer with beta 2 microglobulin. Bovine CD1w3 is expressed by immature cortical thymocytes but not by mature CD2+ or WC1+ cells in peripheral lymphoid tissues. It is also expressed by B cells, monocytes and subsets of dendritic cells. Experiments investigating the binding specificity of Mouse anti Bovine CD1w3 antibody, clone CC43, indicate that the antibody binds to the bovine CD1d molecule (Nguyen 2013). Bovine CD1d binds short chain glycosphingolipids (Wang et al. 2012). Store at +4°C or at -20°C if preferred. Storage in frost-free freezers is not recommended. This product should be stored undiluted. Should this product contain a precipitate we recommend microcentrifugation before use. Howard, C.J. et al. (1993) A new bovine leukocyte antigen cluster comprising two monoclonal antibodies, CC43 and CC118, possibly related to CD1. Vet Immunol Immunopathol. 39: 69-76. Naessens, J. et al. (1993) Cross-reactivity of workshop antibodies with cells from domestic and wild ruminants. Vet Immunol Immunopathol. 39 (1-3): 283-90. Naessens, J. et al. (1997) Nomenclature and characterization of leukocyte differentiation antigens in ruminants. Immunol Today. 18 (8): 365-8. Howard, C.J. & Naessens, J. (1993) Summary of workshop findings for cattle (tables 1 and 2). Vet Immunol Immunopathol. 39 (1-3): 25-47. Nguyen, T.K. et al. (2013) The bovine CD1D gene has an unusual gene structure and is expressed but cannot present α-galactosylceramide with a C26 fatty acid. Van Rhijn, I. et al. (2006) The bovine CD1 family contains group 1 CD1 proteins, but no functional CD1d. Rhind, S.M. et al. (1996) Discrimination of two subsets of CD1 molecules in the sheep. Vet Immunol Immunopathol. 52: 265-70. Gibson, A. et al. (2012) Identification of a lineage negative cell population in bovine peripheral blood with the ability to mount a strong type I interferon response. Dev Comp Immunol. 36: 332-41. Goldfinch, N. et al. (2010) Conservation of mucosal associated invariant T (MAIT) cells and the MR1 restriction element in ruminants, and abundance of MAIT cells in spleen. Gunnes, G. et al. (2000) Accessory cell populations in draining lymph nodes of lambs in the elicitation phase of DNCB-induced contact hypersensitivity. Vet Immunol Immunopathol. 76: 75-88. Jörundsson, E. (2000) Distribution of MHC-II and CD1 molecules in the skin of lambs and changes during experimentally-induced contact hypersensitivity. Vet Immunol Immunopathol. 74: 87-101.